Today we have our final guest post for the Disability in Fiction blog series, with a wrap up post planned for next week. 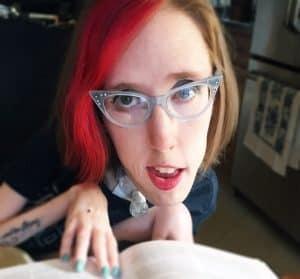 This post, by Erin Hawley of The Geeky Gimp, discusses the issue of ableism in fiction, and the cumulative impact of these continuous micro-aggressions. Growing up as an avid reader, I never came across any disabled authors or characters in literature. Before the internet, I only had access to my small-town school library. Seeking out books with disabled characters never crossed my mind; disability was something that I had and not part of my proclaimed identity as it is now. For most of my childhood, abled was the norm, even though I’ve been disabled my whole life. I was the only visibly disabled person in my social circle, and I wasn’t aware of invisible disabilities as a concept. There isn’t much disability representation now in mainstream media. I only remember those “very special” episodes of Sesame Street or Saved By The Bell where disability was included to teach the abled characters a lesson. That trope is prevalent in literature, too. Look at Me Before You, the book-turned-movie that uses disability as tragedy, where the abled characters’ feelings are the focus. Now I actively search out disabled authors, discovering them through friend recommendations and various book lists online. But even within books by disabled writers, I have trouble finding authors of color represented – the popular books out there lean heavily toward white cis male, which is the default crip in media. But disabled people of color, queer crips, and other multiply-marginalized crips are decentered in the pop-literary sphere, so we must center ourselves. That doesn’t mean we stop fighting to go mainstream, that just means we carve out our space and elevate each other’s voices without pandering to a system that devalues and dehumanizes us. When asked to write this blog post, I struggled to come up with specific examples of ableism in fiction, even though I encounter it all the time. 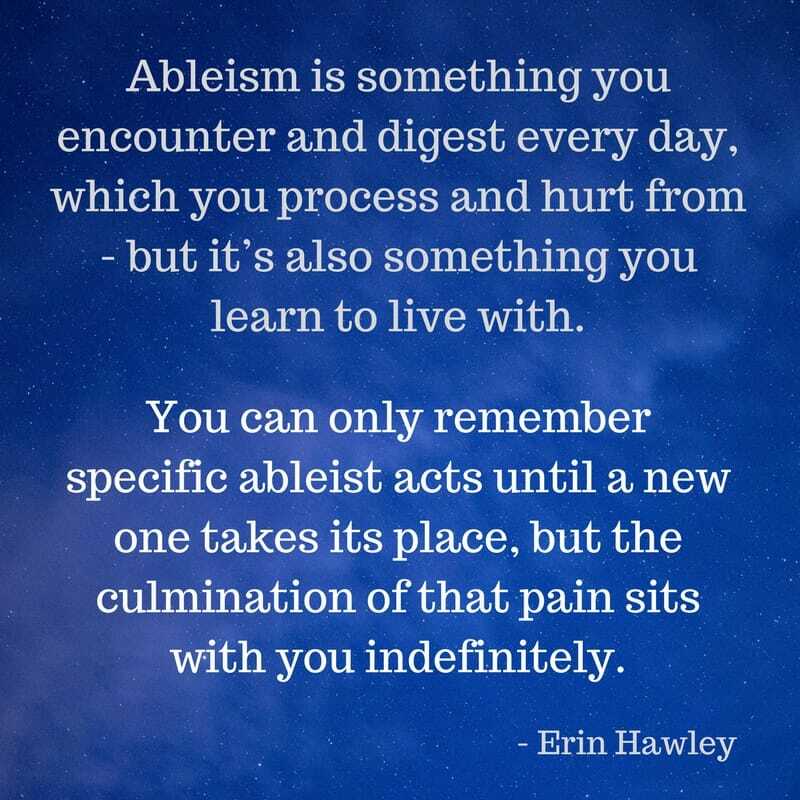 Much of this boils down to my terrible memory, but the pervasive nature of ableism makes everything seem like a wash. Ableism is something you encounter and digest every day, which you process and hurt from – but it’s also something you learn to live with. You can only remember specific ableist acts until a new one takes its place, but the culmination of that pain sits with you indefinitely. In fiction, ableism seeps in through “scary” portrayals of mental illness, like all the books on haunted asylums. It comes in through all the assisted suicide stories that teach readers a lesson on appreciating life to its fullest. Or, like in science fiction and fantasy, ableism exists when disability is erased entirely by magical powers or eugenics. One example I remember from last year is The Last Words of Will Wolfkin by Steven Knight. Someone recommended the book to me because the protagonist is disabled; except the protagonist’s disability is cured in the first chapter, “allowing” that character to go on their fantastical adventure as an abled boy. It portrayed disability as sad, lonely, and unwanted – a trope that not only directly affects the way society views disabled people, but mirrors how society views us. We need to keep talking about ableism in fiction, both as a theme and as a barrier for crip authors. Support disabled writers if you can by purchasing their books or sharing their work on social media. As a community, valid representation matters, and avoiding the single narrative is crucial. Our voices are diverse, and the literature we read or listen to must reflect that; we grow as a society and learn from each other by sharing our stories. Let’s make disability the norm. Erin Hawley is a disabled, latina writer and bibliophile from New Jersey. She writes The Geeky Gimp, a blog on the intersection of disability and nerdy media. You can follow her on Twitter @geekygimp. Years and years back, I remember seeing an animated film with a blind protagonist. I remember thinking, well before online communities and Tumblr SJWs, and modern progressivism, “Wow, this could be really powerful.” And then the film itself was pretty mediocre, a lost opportunity. I confess to being part of the problem. I have a story with a disabled character which I have sat on for literal years, mostly out of a great fear of getting it wrong and causing hurt and offense (and, not gonna lie, fear of backlash if I hurt or offend). But that kind of fear doesn’t contribute to a more varied landscape of characters. I talked a tiny bit about this with author Sharon Wachsler (her relevant essay here: http://www.wordgathering.com/past_issues/issue4/essays/wachsleressay.html) and I’d like to see more on how abled writers can be more inclusive without stepping on any toes. Hi, This is a very good article. I am a disabled writer with Cerebral Palsy myself and noticed many of the same problems you do in media and fiction. I despise assisted suicide tropes or any trope that makes life with a disability seem like it is not worth living so I started writing my own films about disability. The films feature disabled actors and disabled characters of color in major roles. My Tumblr for the films is here http://cripvideoproductions.tumblr.com and you can watch the films for free on youtube via the Tumblr by scrolling down. My newest film is “A Stroke Of Endurance”.